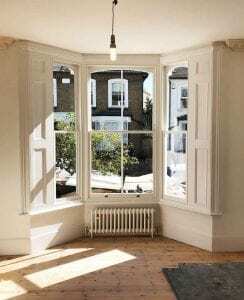 A Full Box Replacement is our most complete replacement of a sash window in which the entire window, including the box frame, is replaced. 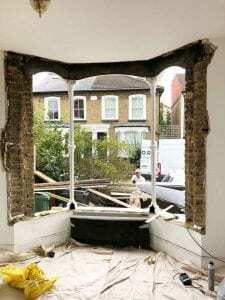 This is in contrast to the ‘sash replacement’ service in which just the sliding sashes are replaced, or the repair services like draught proofing or full restoration. Remove & dispose of existing box frames & sashes. Box frames & ashes will be spray primed with 2 coats of Teknos micro-porous base primer and spray finished with 2 coats of Teknos micro-porous aqua top coat – Standard RAL colour 9016 ‘Traffic White’. Wide range of alternative colours are available on request. Standard double glazed units will comprise of 4mm float glass, a 16mm cavity filled with 90% Argon gas / 10% air, white warm edged thermal super spacers and 4mm Guardian ClimaGuard low emissivity glass. Other glazing options are available on request. New lead weights or spiral balance springs (where applicable) to be supplied & fitted. Sashes to be hung on white waxed cotton sash cords. Aquatex A10 weatherseal (white) will be fitted to sides of top & bottom sashes, top of top sash and bottom of bottom sash. Aquatex D slot weatherseal (white) will be fitted to meeting rails. New bull-nose sills or window boards will be supplied & fitted. 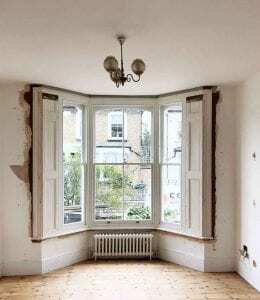 All surrounding interior plasterwork will be made good where necessary. Paintwork on surrounding interior walls will be touched up where plasterwork has been made good. *Wall paint must be supplied by client. New windows will be pointed on the exterior using the traditional sand & cement method. *Silicone sealant will only be used if requested by client. New box frames and sashes will be decorated with 1 extra coat of Teknos micro-porous top coat in-situ. This is a good sample of what your bay will look like with all the windows removed. Don’t worry though – we never remove what we can’t replace in the same day! The bay is now fully finished and painted. If you like the finish, why not get a costing for a comprehensive fit of your own? If you like the sound of our Full Box Replacement service, get a price with our Online Estimating Tool!